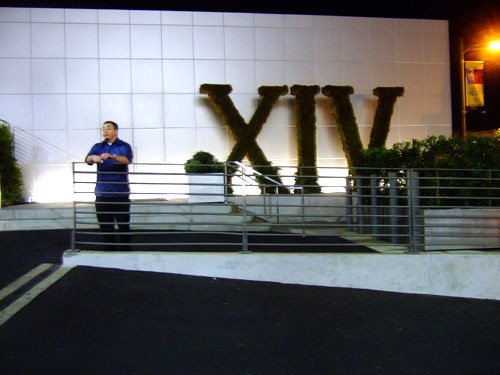 XIV ("fourteen," though I still catch myself saying "X-I-V") marks Michael Mina's return to Los Angeles after a two decade long hiatus; apparently, Mina actually started out as a pastry chef at the Hotel Bel Air. Coincidentally or not, XIV is also Mina's 14th restaurant. 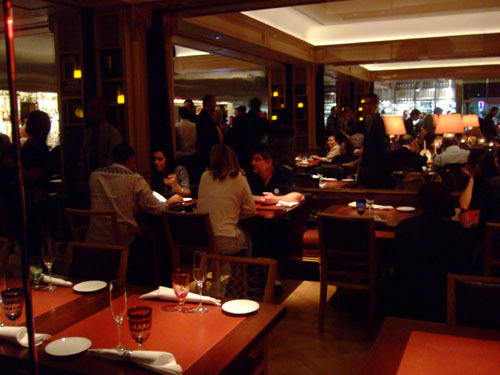 Having tried two of his other establishments, the original Michael Mina in San Francisco, and Stonehill Tavern in Dana Point, I was eager to give XIV a shot, and made it a point to book reservations on opening night. 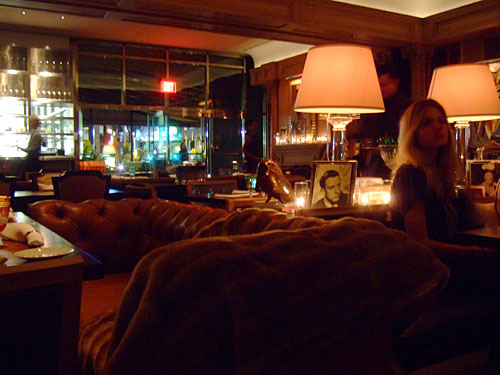 XIV's space used to house the nightclub Privilege, the Shelter supper club, and the bar and club Coconut Teaszer (a fixture of the LA rock scene). As such, the exterior doesn't really look like a restaurant, though it certainly is dramatic. Anchored by a well-manicured "XIV" hedge, the facade is covered in white tile, and you can barely make out the door (which is just behind the person in the photo). 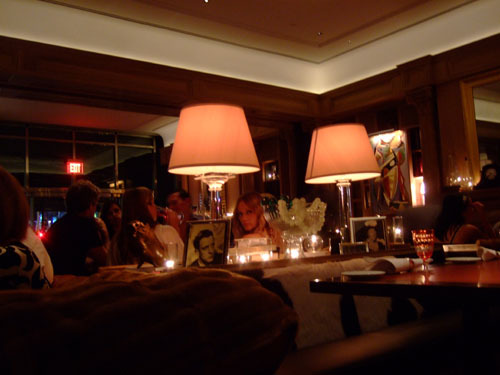 Compared to the stark exterior, the Philippe Starck-designed interior is a throwback to the times of Louis "XIV." Meant to mimic the interior of a European chateau, the space makes me think of an aristocrat's living room, replete with dark wood, fur-draped sofas, fireplaces, bookshelves, and eclectic artwork adorning the walls. However, Starck contrasts this antiquity with a bar of stainless steel, which runs nearly the entire length of one side of the room, as well as a gleaming, open kitchen. Outdoor seating is available in a corner patio area. 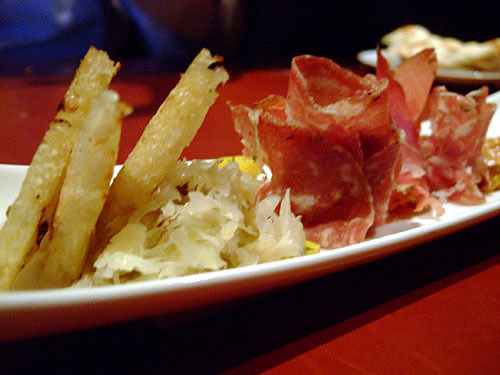 The menu is divided into seven sections, with five dishes each. We were told that there are also vegetarian and vegan versions of the menu as well. The idea is interesting: basically you choose items that everyone at the table will eat, so in a sense it's "family-style" dining. 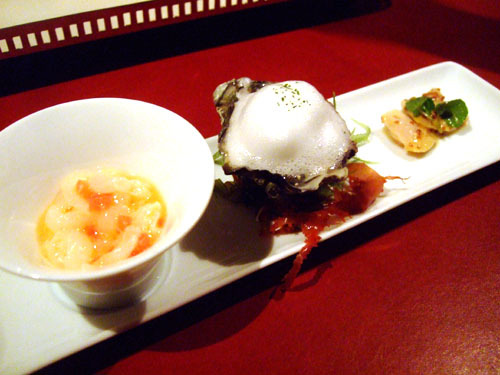 At the same time, it's a tasting menu in that each item is brought out divided into small tasting portions. Not being satisfied with that paradigm, I proposed something ambitious: that we order two of everything on the menu. This was something that I'd never seen attempted before, and I honestly wasn't sure if we could even pull it off (both in terms of stomach capacity and willingness on the restaurant's part). 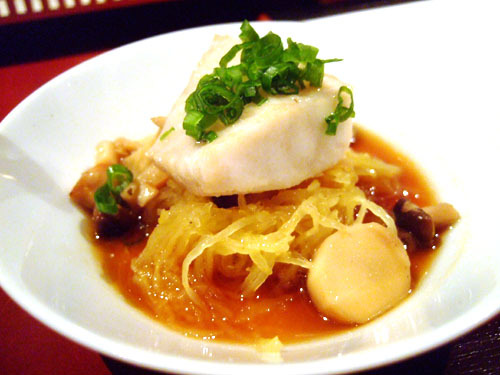 If successful, this would break record for number of courses consumed, set at Urasawa. 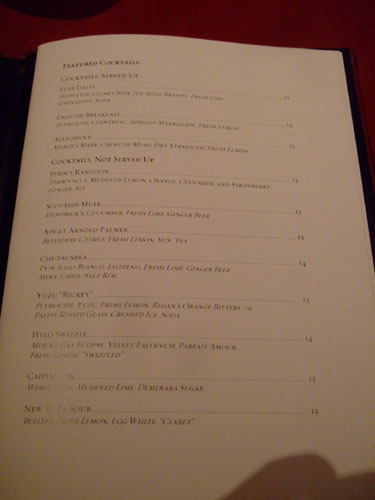 Fortunately, the staff at XIV was able to accommodate this unique request, and I think even delighted in having a party attempt a "gamut" (I believe that's what the restaurant called the feat). 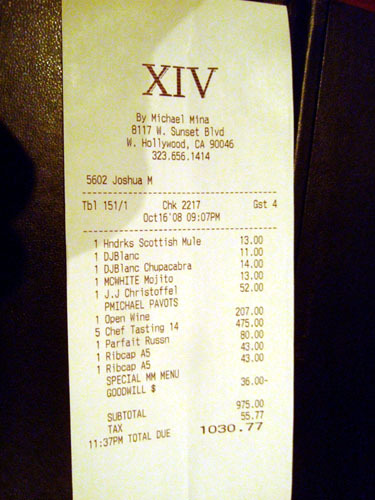 Instead of ordering 70 courses at $8 each, we were able to price it out via five orders of the "Fourteen from XIV" for $95. 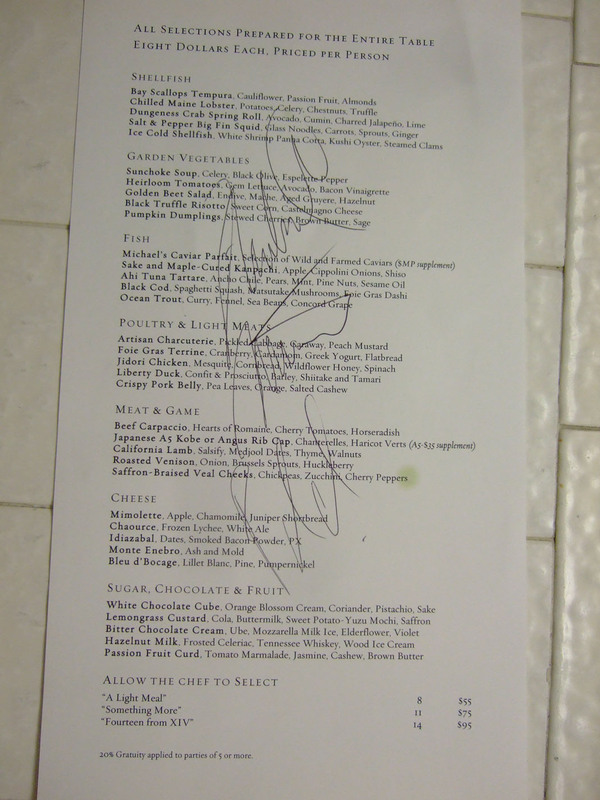 Note the signature of Executive Chef Michael Mina on the menu. Click for a larger version. A fascinating selection of cocktails complements the wines by the glass list. However, for wine, we decided to do it by the bottle. Prices are very reasonable, with markups in the 2-3x range for the most part. 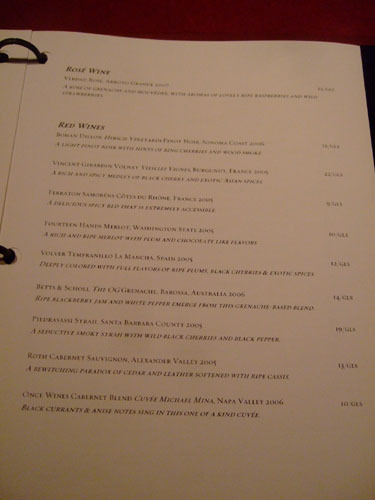 There are some extreme values though, such as the 2005 Araujo Eisele Vineyard Cabernet Sauvignon for $295 (I paid more for mine and I'm on the mailing list!). Click for larger versions. 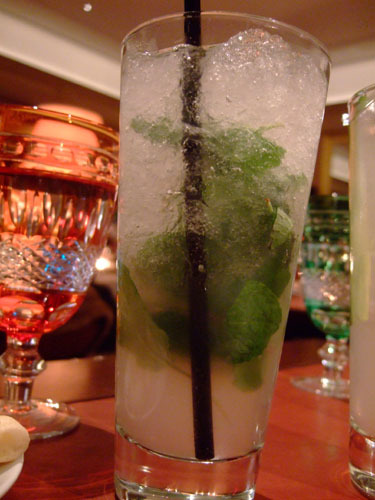 For cocktails, I started with a Mojito [$13] of course; it was a solid example, very well-balanced and not too sweet, with a nice bite of mint. 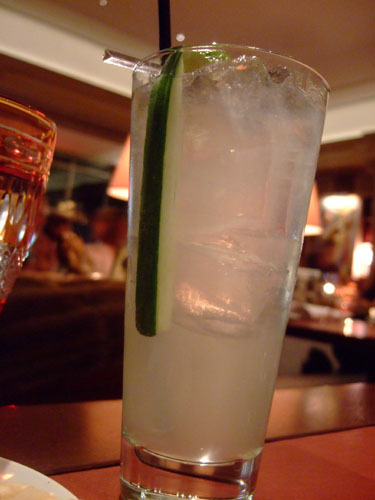 One of my dining companions ordered the Scottish Mule (Hendrick's Cucumber, Fresh Lime, Ginger Beer) [$13], which was my favorite of the bunch, with a delightful cucumber flavor backed by just a hint of ginger; very refreshing. 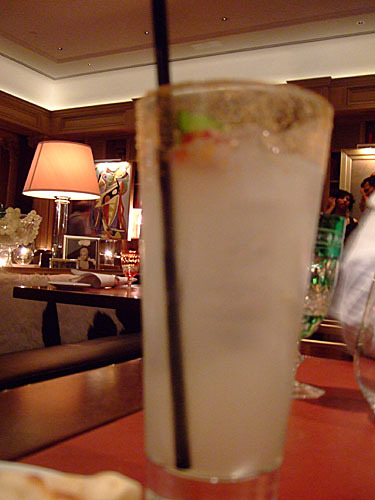 Finally, there was the Chupacabra (Don Julio Blanco, Jalapeño, Fresh Lime, Ginger Beer, Mint, Chile-Salt Rim) [$14], with its spicy/sour interplay; I apologize for the out of focus photo here. Instead of bread, naan was provided. 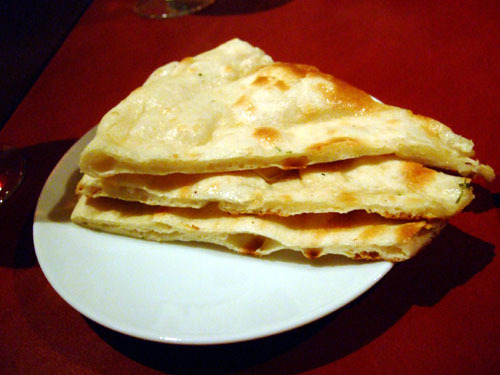 Naan is, of course, a Central and South Asian flatbread made of flour, and cooked in a tandoor. Apparently, it was Michael's idea to have this, perhaps as a nod toward his Middle Eastern background (he's from Egypt). In any case, we all enjoyed the naan, with its fluffy yet crunchy texture and rich, buttery flavor. 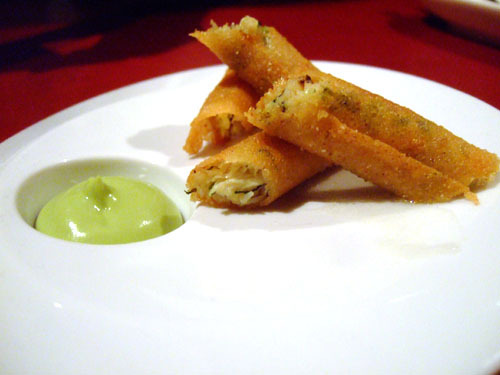 In fact, it was better than the naan at many Indian restaurants; now they just need to do a garlic version! There was no amuse bouche, so we got right into the first course of the meal. The parfait here was topped with farmed Ossetra caviar, at a $60 per serving supplement (our server mistakenly quoted $40, and told us of the mistake afterwards; we were only charged for $40 though). Paddlefish roe and wild Ossetra were also available. In any case, this was a fantastic start to the meal. 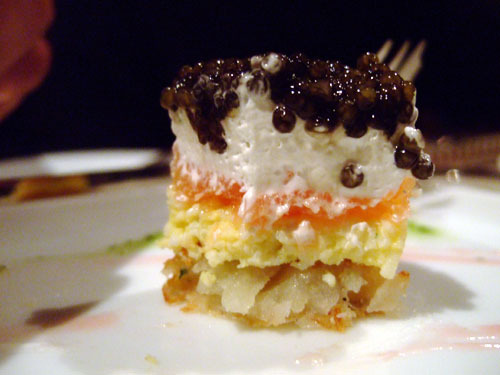 It was a multilayered affair, with the briny, nutty caviar on top, followed by creamy, tangy crème fraîche, smoked salmon, egg, and finally a potato croquette on the bottom. All the flavors melded seamlessly together, and the potato added a great textural contrast. This was arguably my favorite dish of the night. Magnifique! White Shrimp Panna Cotta, Kushi Oyster, Steamed Clams. 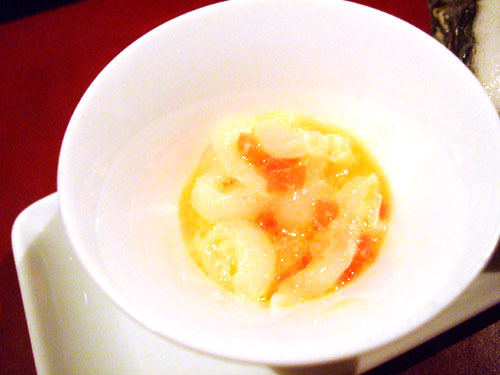 The shrimp were described to us as "sweet shrimp," but I think they were the same as the "shiro ebi" I had on my first trip to Urasawa; the shrimp were lovely, especially when taken with the underlying panna cotta cream. Next, though the menu said "Kushi," we were told the oyster was a Kumamoto, my favorite type. 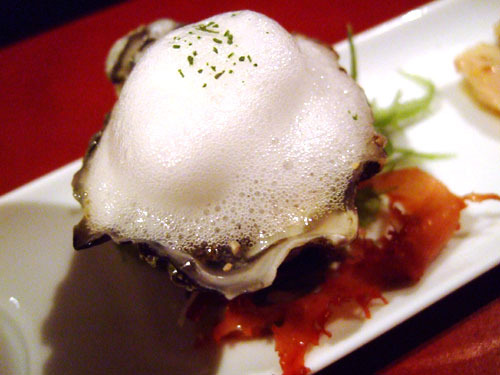 The shell shape certainly looked liked a Kumamoto, and the mild flavor backed up that claim; the foam was interesting, in that it tended to punctuate the oyster's natural flavor. Finally, we had cured littleneck clams; I forget what they were marinated in, but they had a subtle sweetness that counteracted their briny natural flavor. 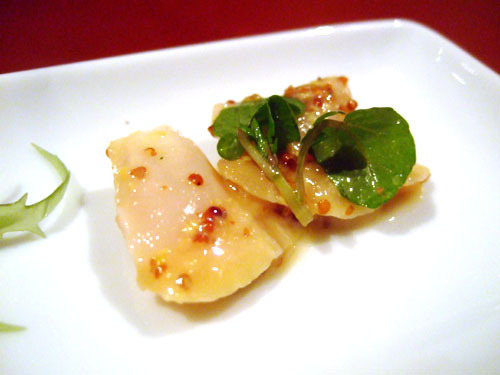 Ancho Chili, Pears, Mint, Pine Nuts, Sesame Oil. 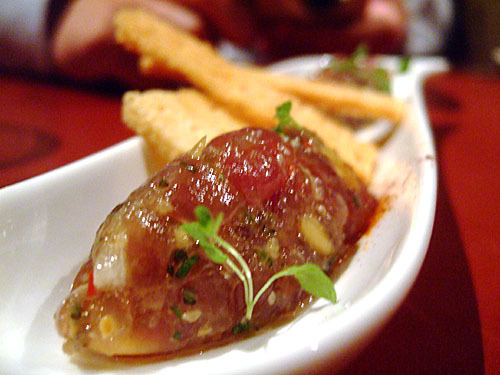 Tuna tartare is almost a staple for me. This version had a somewhat richer, more complex flavor than I'm accustomed to, which was a good thing. The sesame oil and ancho were probably the main contributors to this, and the use of pine nuts added a wondrous crunch to the tartare. Nice! Potatoes, Celery, Chestnuts, Truffle. The lobster itself was solid, fresh, subtle, with a nice texture, but what really set this dish apart for me was the use of potato. It really provided a contrasting taste and texture that added complexity to a dish that could've been quite boring otherwise. Apple, Cippolini Onions, Shiso. The fish had a firm texture, not too fatty, but very smooth; it wouldn't have been bad as sashimi. 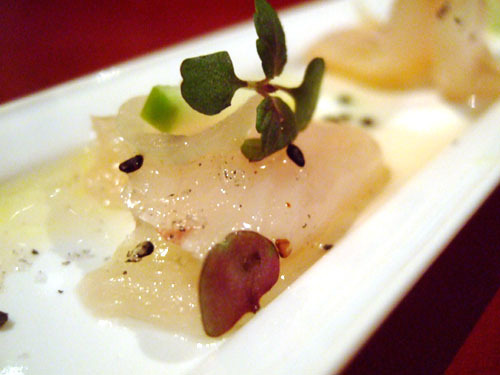 The cure, meanwhile, gave the kanpachi a bit of an aromatic flowery flavor that worked out pretty well. 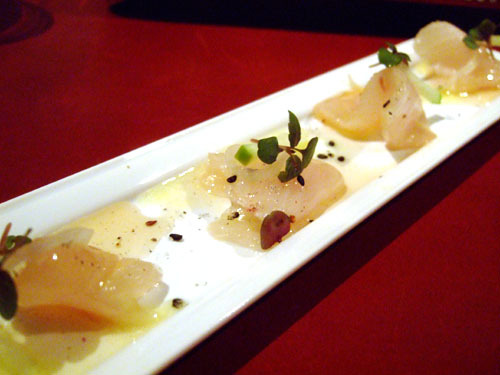 This reminded me a bit of the crudo I had at Blanca in Newport. 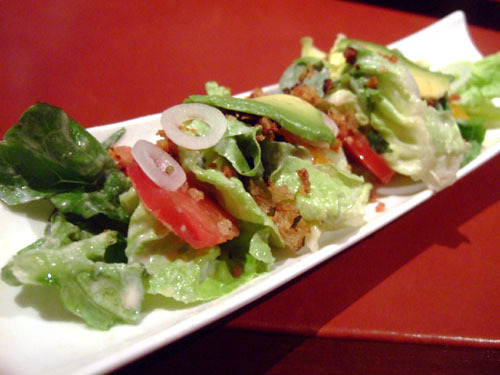 Gem Lettuce, Avocado, Bacon Vinaigrette. I'm not a salad person, but I really enjoyed this. The heirloom tomatoes actually took a back seat for me. Rather, the bacon was the star. In addition to adding a fantastic textural crunch to the salad, it provided an offsetting saltiness to the mild, crisp lettuce and the creaminess of the avocado. Bacon does make everything better. Very nice! Endive, Mache, Aged Gruyere, Hazelnut. This salad was much milder. 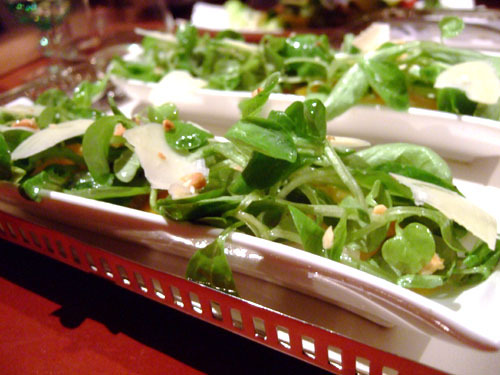 The greens themselves provided most of the interest here, while the beet and Gruyere served more supporting roles. I think this would've benefitted from a tangy vinaigrette dressing, as like this, it was a bit boring. Pickled Cabbage, Caraway, Peach Mustard. There were three types of meat here; one was speck (an Austro-Italian juniper-flavored prosciutto), but unfortunately I don't recall the other two. My favorite was the one to the far left. The pickles (reminiscent of sauerkraut) were a nice touch, as was the mustard with its lovely peach tang; fortunately, the accoutrements didn't overpower as they did at Charlie Palmer. After we were done with our cocktails, we opened our first wine of the night, the Joh. Jos. 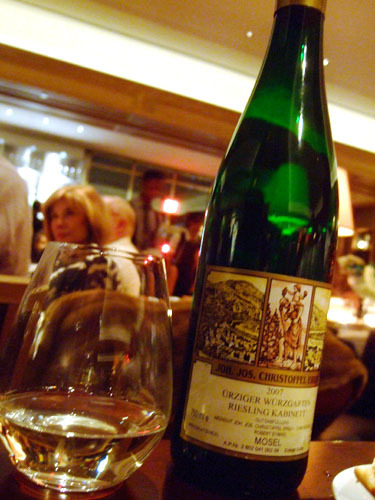 Christoffel Erben "Ürziger Würzgarten" Riesling, Kabinett, Mosel, Germany 2007 [$52], to go with some lighter dishes. This was a quintessential expression of German Riesling (my favorite type of Riesling), with fine stone fruit and floral flavors balanced by a light acidity, leading to a juicy finish. The wine retails for around $30, so the price of $52 was very reasonable. 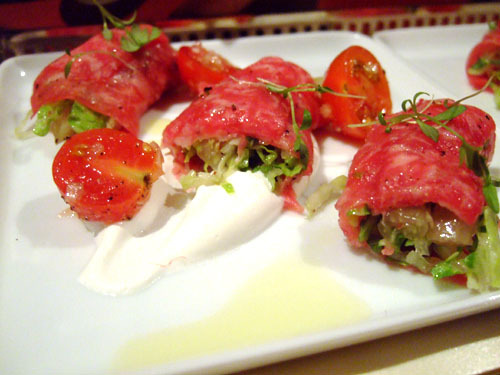 Hearts of Romaine, Cherry Tomatoes, Horseradish. This wasn't what I was expecting. I'm used to my carpaccio being laid out flat, not rolled. Nevertheless, this turned out to be a great dish. The beef wasn't actually the main focus for me; it was the lettuce that stole the show. 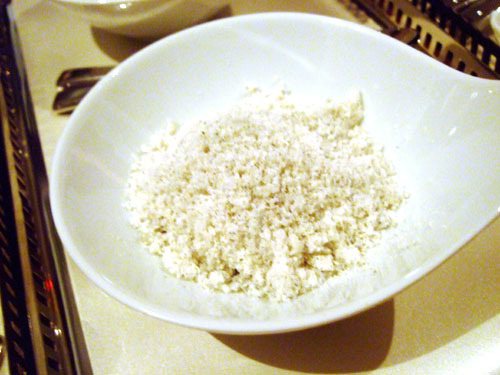 It's mild crunchiness was a great accompaniment to the meat, and the horseradish added a soft kick to everything. I didn't see a need for the tomatoes, but they certainly didn't distract from the dish. Cauliflower, Passion Fruit, Almonds. I've never had scallops quite like this before. 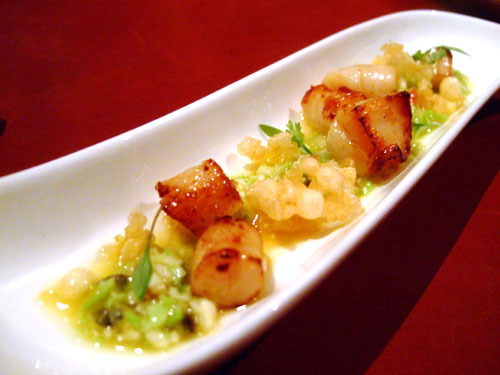 The scallops themselves were not prepared tempura-style, but rather nicely sautéed to a golden brown, with a rich, sweet flavor. 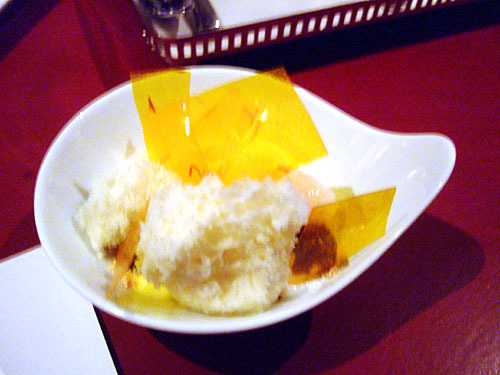 They formed a great interplay with the crispness of tempura vegetables and almonds, as well as the sweetness of passion fruit. The overall effect in the mouth was very pleasing. Avocado, Cumin, Charred Jalapeño, Lime. 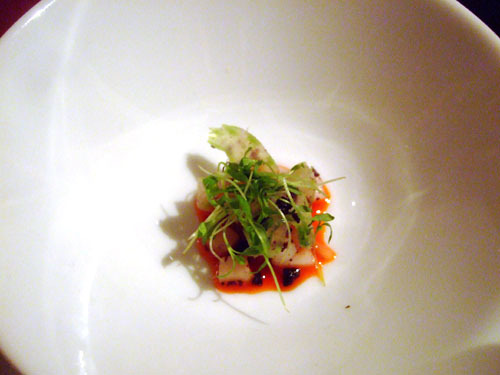 This was one of the weaker dishes for me. The rolls were a bit nondescript, and I couldn't really pick out the crab and its signature sweetness. Things did improve with the avocado dipping sauce, but I think a non-fried goi cuon-esque summer roll would've worked out better here. Glass Noodles, Carrots, Sprouts, Ginger. This definitely had an Asian flavor to it, with the slight sweetness of ginger balanced by the tinge of salt and pepper. 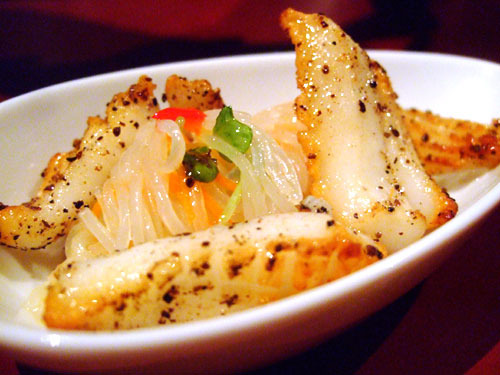 The squid had a pleasant consistency, while the noodles added an interesting element to a dish that would've otherwise been too plain. Cranberry, Cardamom, Greek Yogurt, Flatbread. 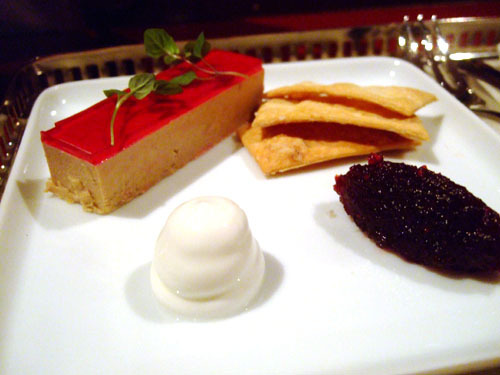 I much prefer my foie in terrine or pâté form, and this preparation did not disappoint. 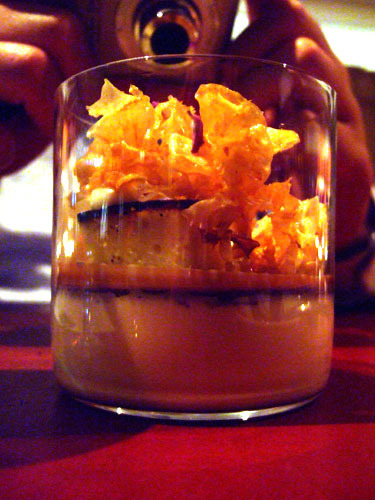 The foie was dense, rich, creamy, yet delicate. 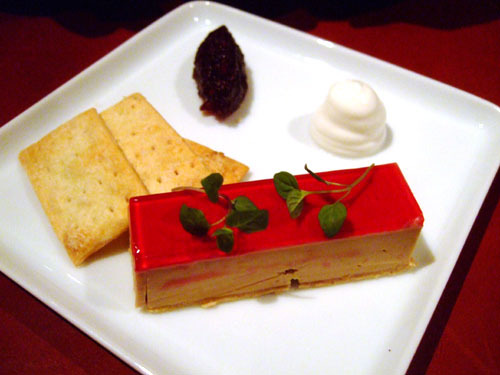 Its flavor was enhanced by the use of cranberry, which added sweetness, and yogurt, which contributed sourness. This was one of the best dishes of the night and actually compared quite well to the legendary foie gras terrine I had at French Laundry (still my favorite!). Sweet Corn, Castelmagno Cheese. I think this was my first experience with Castelmagno, an Italian semi-hard cow's milk cheese from Piedmont. 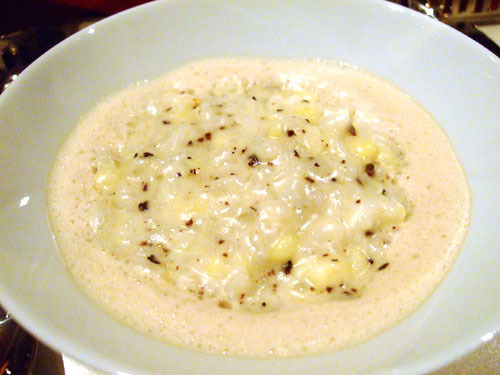 The cheese added richness and depth to the risotto, while the corn contrasted that with a marked sweetness. Very nice, though I would've liked more truffle. 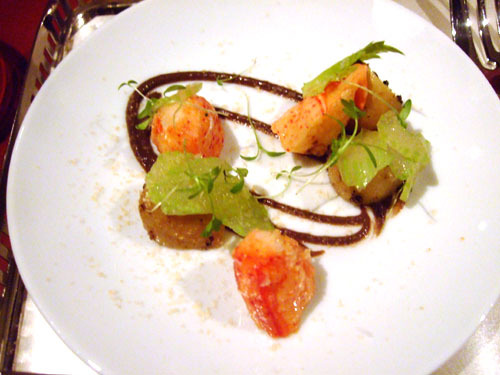 Celery, Black Olive, Espelette Pepper. The various ingredients came presented as shown in the first photo; our server then proceeded to pour on the sunchoke soup. Sunchokes are also known as Jerusalem artichokes, though they're not really artichokes. They do have a flavor I'd describe as a mix between artichoke and potato, and thus, the resultant soup was rich, delicious, and heartwarming, perhaps too much so, as it tended to drown out the flavors of the celery, pepper, and olive. Stewed Cherries, Brown Butter, Sage. Sadly, this turned out to be one of my least favorite dishes of the night. The nose was intensely cinnamon, while on the palate, all I could taste was the overwhelming sweetness of pumpkin. One of my dining companions described the taste as "savory pumpkin pie." I think a milder squash would be more to my liking. 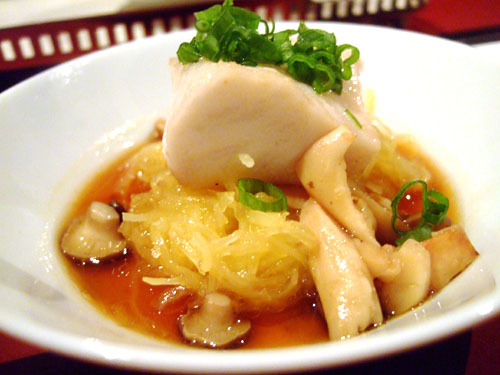 Spaghetti Squash, Matsutake Mushrooms, Foie Gras Dashi. 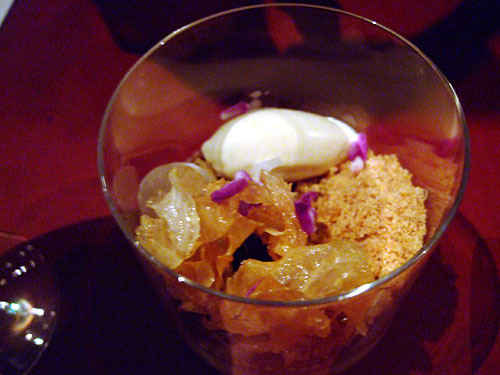 Dashi is a Japanese broth made from kombu (kelp) and katsuobushi (bonito shavings), and the addition of foie gave it an uncharacteristic richness and saltiness. I think the ingredients here tended to mask the delicate taste of the fish, and sadly, the fantastic flavors of matsutake mushroom (which I enjoyed greatly at Urasawa recently) were lost as well. The fish did have a lovely texture though, perhaps the result of sous-vide cooking? 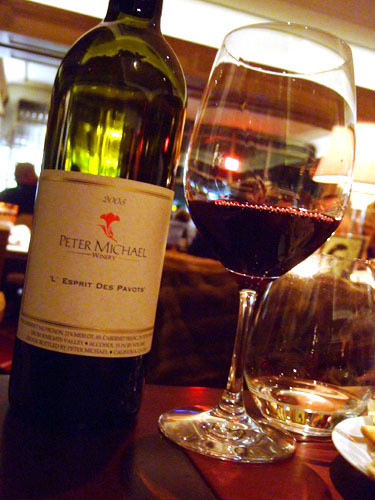 To go with the heartier dishes, our choice of red was the Peter Michael L'Esprit des Pavots, Knights Valley, Sonoma 2005 [$207]. "L'Esprit" is the sister wine to the famed "Les Pavots" and is also a red Bordeaux blend, consisting of 73% Cabernet Sauvignon, 21% Merlot, 4% Cabernet Franc, and 2% Petit Verdot. I thought it was quite delicious, with plenty of dark fruit, smoke, and a bit of mint. Spiciness develops in the mouth, and a mild acidity picks up in the finish. The wine retails for around $100. Mesquite, Cornbread, Wildflower Honey, Spinach. All the rage these days, Jidori chickens are premium birds raised cage-free on all-natural grain diets. The result on the plate was chicken that almost didn't seem like chicken. 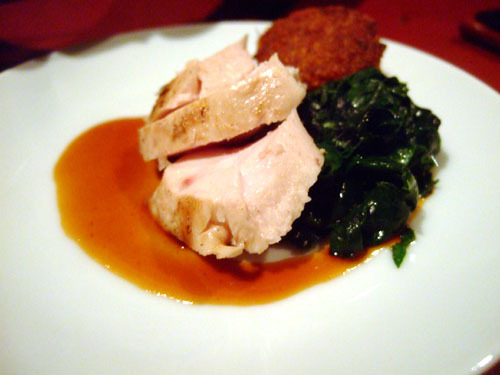 The flavor was extremely mild, and the texture almost creamy (something quite atypical of chicken!). 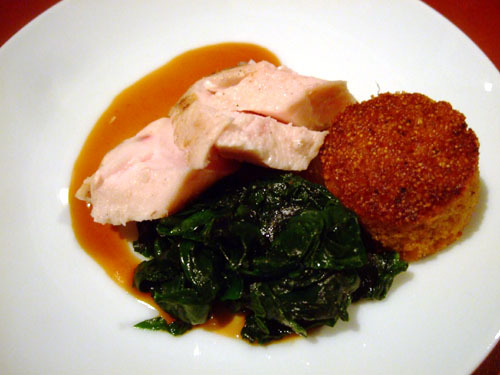 The spinach, meanwhile, added a resounding bitterness into the mix while the cornbread and its tough consistency proved to be a pleasing foil. Chicken and cornbread: reminds me of KFC! 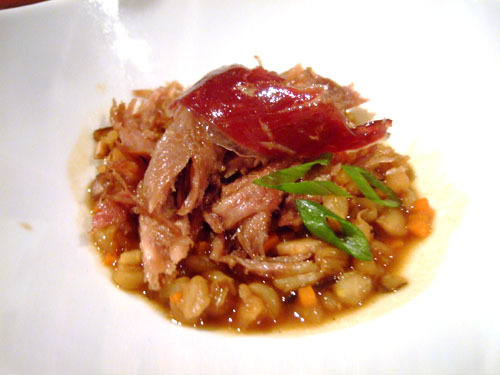 Confit & Prosciutto, Barley, Shiitake and Tamari. 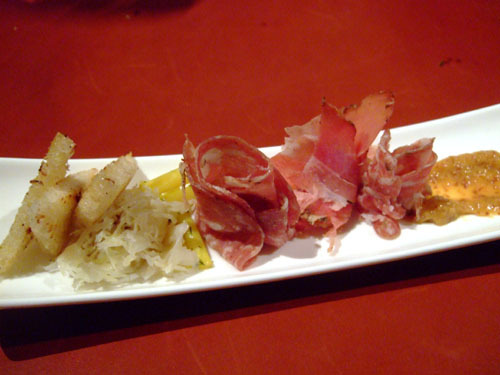 I enjoyed the pairing of the rich duck confit with the salty prosciutto. The barley formed an almost risotto-like base for the duck, but the use of tamari (a traditional, low-wheat soy sauce) here made it a bit too strong. It actually drew my attention away from the duck. Curry, Fennel, Sea Beans, Concord Grape. 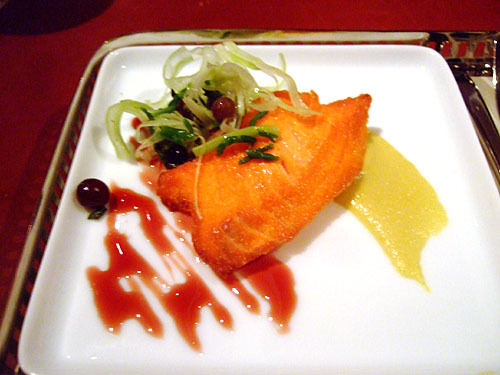 The trout had a flaky, salmon-esque consistency to it which I enjoyed, along with a strong, briny sea flavor. I think it would've been fine like this, but the taste was subsequently tempered by the sweetness of fennel and grape, which didn't work so well. Pea Leaves, Orange, Salted Cashew. 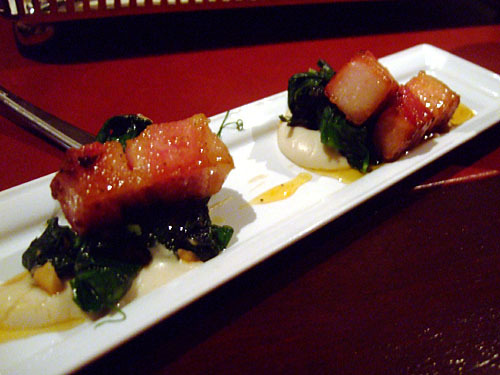 On its own, the pork belly was almost too rich, too fatty. The key I found was to eat it with the pea leaves, which provided a crucial offsetting bitterness. This combination proved very satisfying. I avoided the orange sauce though, which I thought was overly sweet, and reminded me of sweet and sour pork! Chickpeas, Zucchini, Cherry Peppers. I usually think of veal as quite boring to be quite honest. This however, was far from it. Due to the braising, the veal was as tender as I've ever had, with a bit of sourness to it (due to the saffron probably), which made things interesting. 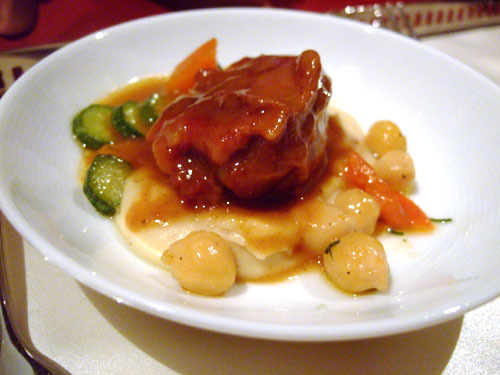 The chickpeas added a well-placed, hard contrast to the softness of the meat and mashed potato. Chanterelles, Haricot Verts. The standard meat here is Angus rib eye, though we paid a $43 ($35 on the menu?) supplement for A5 (the highest grade) Wagyu beef. 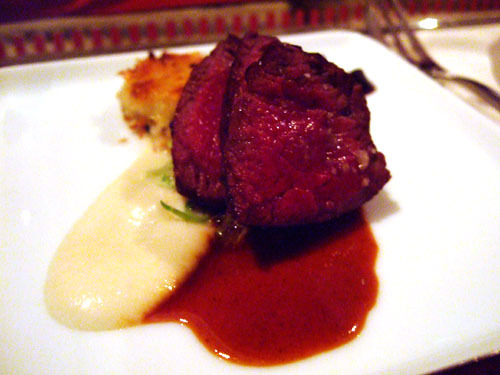 I found the meat resoundingly rich and flavorful, not unlike a steak at CUT actually. With beef this good, the accoutrements were totally redundant. Salsify, Medjool Dates, Thyme, Walnuts. I'm usually a big fan of lamb, but found this preparation lacking in flavor. Perhaps it was due to the cooking in a thermal immersion circulator (which circulates warm water over sealed bags of food at a precise, constant temperature), but this lacked the "lamb-y" goodness that I was looking for. 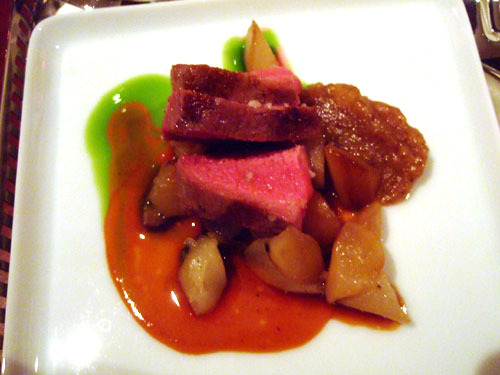 Perhaps the lamb was meant as a canvas for the various accompaniments, but I found them far too sweet. This dish needed to be much more savory. Onion, Brussels Sprouts, Huckleberry. This was one of the strongest preparations of venison I've had. It was somewhat similar to beef, but not nearly as fatty, but at the same time just as flavorful. I was afraid that the sauce might overwhelm the meat, but that simply just wasn't the case. 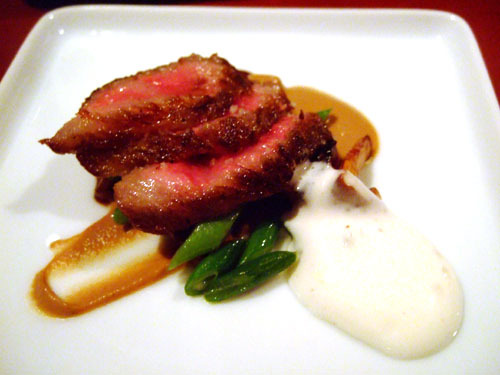 As with the A5 Wagyu though, I found the other parts of the dish to be superfluous. With the venison being the last of the savory courses, it was time for cheese. 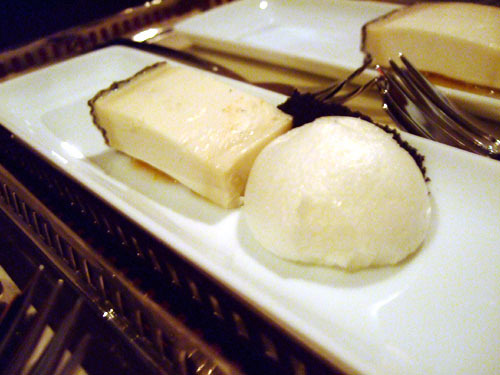 Unlike all the other dishes, the cheese was served simultaneously, which we greatly appreciated. Dates, Smoked Bacon Powder, PX. Idiazábal is a mildly smoky, nutty cheese made from unpasteurized sheep's milk, from the Basque region in Spain. 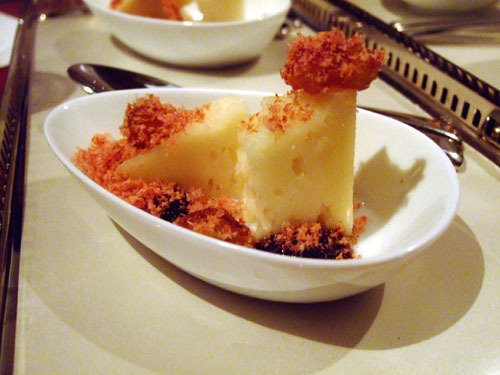 The dates and PX (Pedro Ximénez) added a sweetness to the cheese, but the main flavor component here was the bacon, which melded so seamlessly with the cheese that the two were almost one. 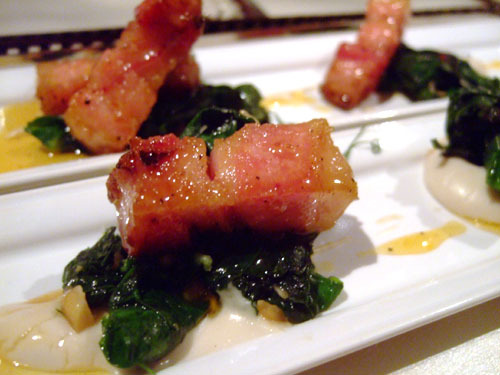 As I've stated before, bacon tends to make everything better, and here it actually reminded me of the Chinese rousong (dried pork with a fluffy texture)! Lillet Blanc, Pine, Pumpernickel. Bleu du Bocage is a goat's milk blue made in Vendée, France. It was actually relatively mild for a blue, with a bit of toast and tartness that was offset by the flavor of the Lillet Blanc (an apéritif from Bordeaux). I didn't get much of the pumpernickel though. Apple, Chamomile, Juniper Shortbread. Traditionally produced around Lille, France, Mimolette is a cow's milk cheese with a distinctive orange hue (sort of looks like dried apricot in the photo!). It had a somewhat salty, nutty taste, with a hard complexion . The pairing of the cheese with its accompaniments seemed a bit odd, though palatable. Ash and Mold. A Spanish cheese, Monte Enebro is made from pasteurized goat's milk. It had a great, tangy flavor with a smooth, creamy consistency, and was arguably my favorite cheese of the night. The exterior of the cheese is covered in mold, commonly referred to as ash, so I can understand where the "Ash and Mold" name comes from, but I still don't know what the two ingredients actually were. The "mold" did taste like yogurt, but the "ash" has me baffled. Frozen Lychee, White Ale. I'm a fan of rich, creamy cheeses like Brillat-Savarin and Camambert, so it was no surprise that I enjoyed the Chaource, an unpasteurized cow's milk cheese from Champagne, France. The cheese was a fantastic complement to the lychee and white ale, and eating all three components together was heavenly. 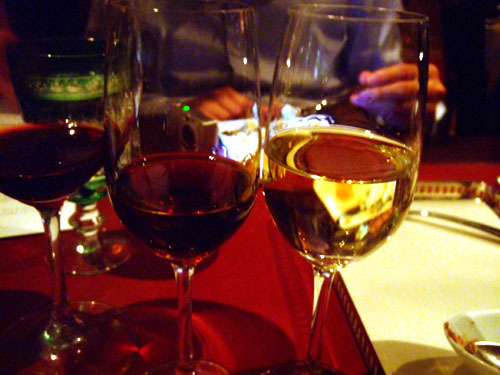 For dessert, we first tried a glass of Rare Wine Co. New York Madeira, Malmsey [$11]. It went well enough with the cheese, with its rich, coffee-like flavor. Next, we received a complementary glass of Weinlaubenhof Alois Kracher Cuvée Beerenauslese, Burgenland, Austria 2006 [$12]. 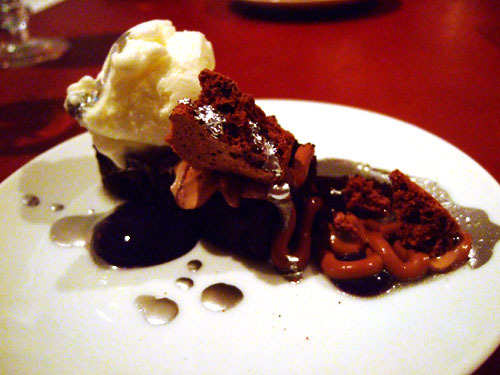 Replete with notes of honey and flower, the wine stood up nicely to the sweetness of the desserts. Orange Blossom Cream, Coriander, Pistachio, Sake. 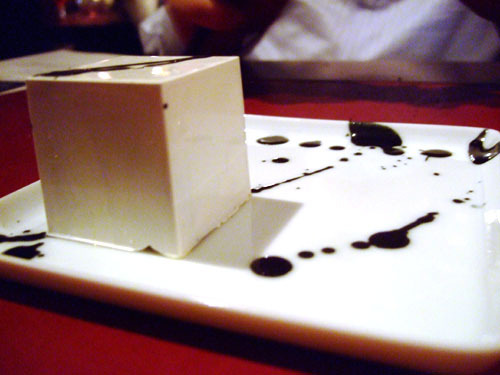 The work of Pastry Chef Jordan Kahn, this seemed more like modern art than a dessert. 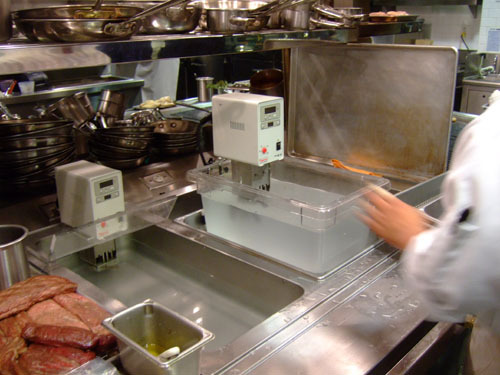 In addition to French Laundry, Kahn has worked at Alinea (a place known for its avant garde cuisine), and this definitely would not look out of place there. 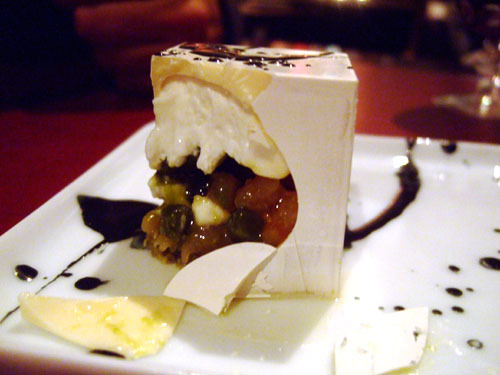 The cube had a surprisingly resilient shell, but once I broke through, I was award with a multilayered amalgam of apricot, pistachio, orange, and yogurt. It was a complex sweetness that was simply brilliant. 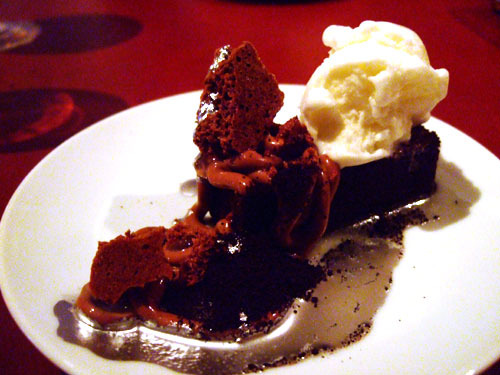 If XIV needs a signature dessert, let this be the one! Tomato Marmalade, Jasmine, Cashew, Brown Butter. I tried the brown butter by itself, and my god, it was strong! 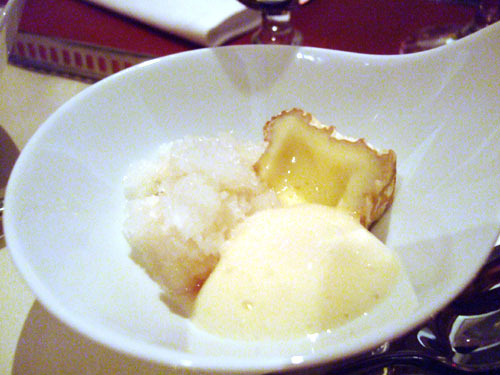 But paired with the mildness of the curd, the intense flavor of burnt sugar actually worked pretty well. The effect of the jasmine and tomato was largely lost on me though. 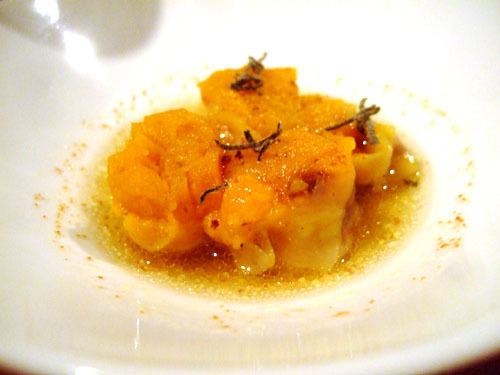 Cola, Buttermilk, Sweet Potato-Yuzu Mochi, Saffron. 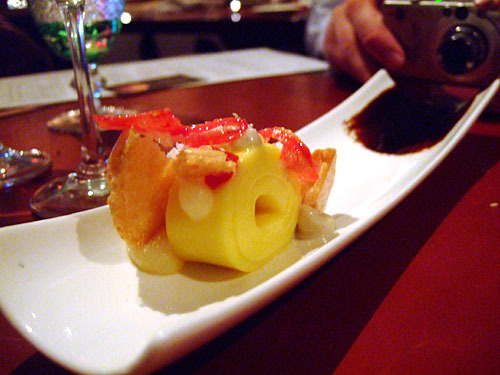 The mochi here was immensely fascinating, and really was the star of the dish for me. 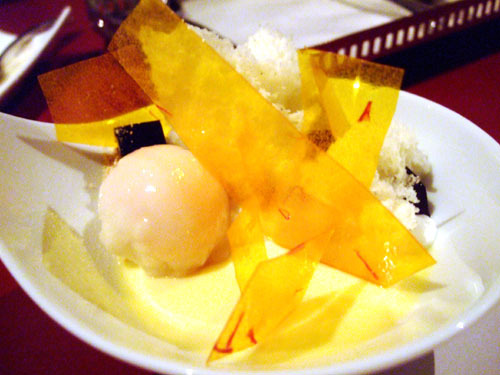 Its light, fluffy texture formed a fitting contrast for the creaminess of the lemongrass custard and buttermilk, while the overall the taste was almost Thai-like in nature. Just be careful not to cut yourself on the saffron "glass!" Ube, Mozzarella Milk Ice, Elderflower, Violet. Sure, I've eaten gold plenty of times, but this was my first experience with silver! Looking like the ink from a metallic pen, the silver-infused sauce was simply mesmerizing. I had to concentrate to let it not distract me from the cake and the wonderful mozzarella ice cream, which was reminiscent of string cheese, but with more sweetness. Frosted Celeriac, Tennessee Whiskey, Wood Ice Cream. The last course. 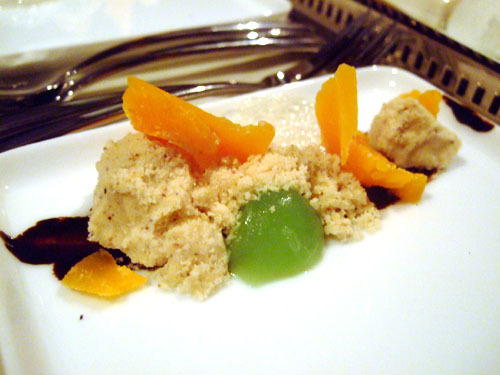 Again, a very playful and inventive dessert. 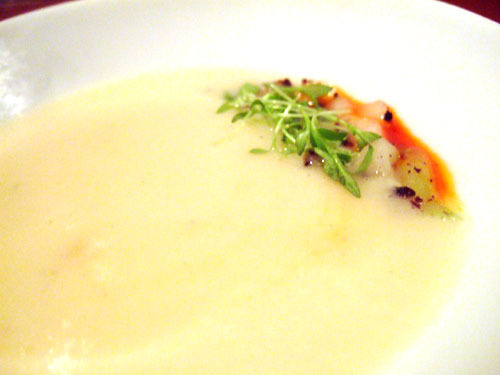 Celeriac is a kind of celery root, and here took a form not dissimilar to Frosted Flakes. We were instructed to mix everything up before drinking, again, a very Alinea-esque touch. The resulting concoction had a strong hazelnut base, punctuated by hints of wood and whiskey. Très cool! 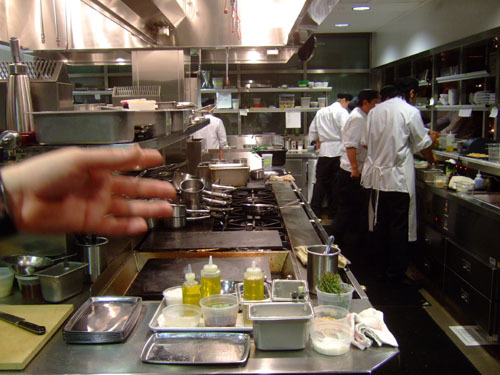 At the conclusion of our meal, Chef de Cuisine Steven Fretz took us on a brief tour of the kitchen. In the first photo, we see the hot station in the foreground, in front of the fish station. 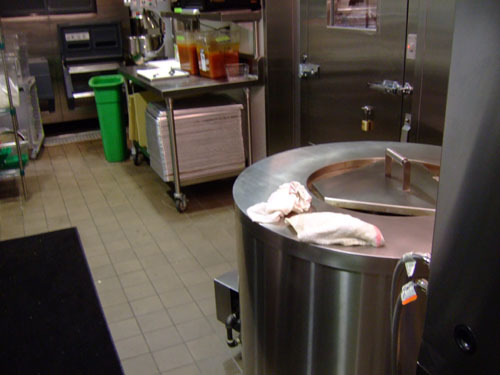 The second photo shows the tandoor used to prepare the naan, and finally we see the thermal immersion circulators used in XIV's sous-vide cooking. Our final bill was somewhat strange. 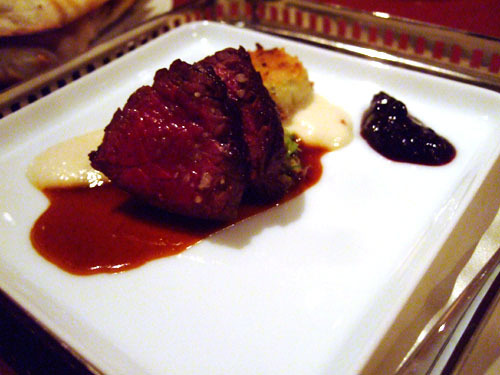 The A5 Wagyu upgrade was $43 per person instead of the $35 on the menu. Also, it appears that $36 of "goodwill" was written off; this is the first time I've ever seen mention of that on a check. In any case, the numbers don't add up (it should be $951 prior to any "goodwill"), and we were grossly undercharged for tax. 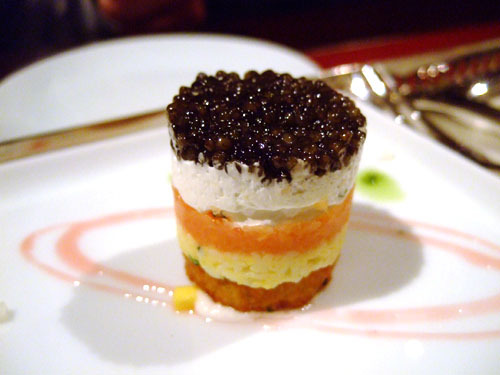 In the end, we didn't make a fuss, since the restaurant was very accommodating to our requests, we were charged $40 per person instead of $60 for the caviar, we received a complementary glass of Kracher, and it seemed like the restaurant took care of the $14 charge for parking. It's pretty much a wash I'm sure. 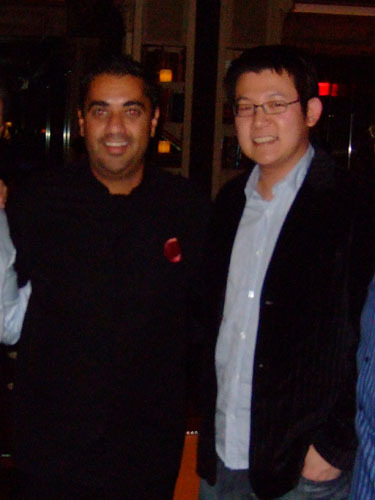 On the left, we have a photo with Executive Chef Michael Mina, who came out to speak with us during the course of the meal. 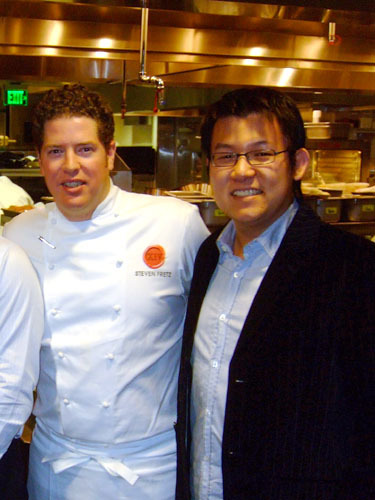 Next is a photo with Chef de Cuisine Steven Fretz during our kitchen tour. Quite simply, XIV turned out to be surprisingly good. I came in expecting disaster, but Mina and company delivered on nearly every front, especially when considering that this was opening night. Despite some misses, the food was, in general, quite good. Some dishes were too ambitious, but for the most part, the unique combinations of taste and texture worked out marvelously. 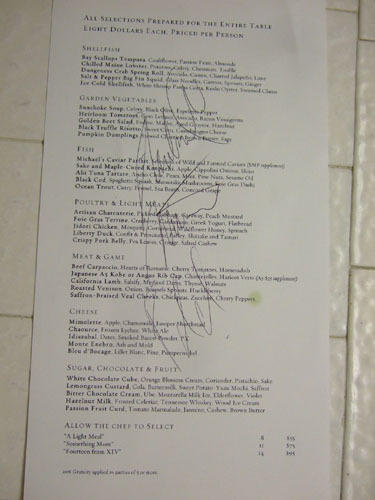 The staff is also to be commended for putting up with us and our "special" needs, especially Sommelier Christopher Lavin. And speaking of the staff, XIV's must have been the most beautiful I've ever encountered; indeed I certainly don't mind some eye candy both on and off the plate! In any case, XIV is a serious restaurant, with serious food. My only concern is the target clientele, which didn't seem nearly as serious. I wonder if the Hollywood crowd will be enough to support a place like this, which is pretty much just a restaurant, with no "club" aspect to it. Time will tell, but in the meantime, welcome back to LA Mr. Mina! I want to go and I want to go now. That looks incredibly delicious and awesome: I am jealous. 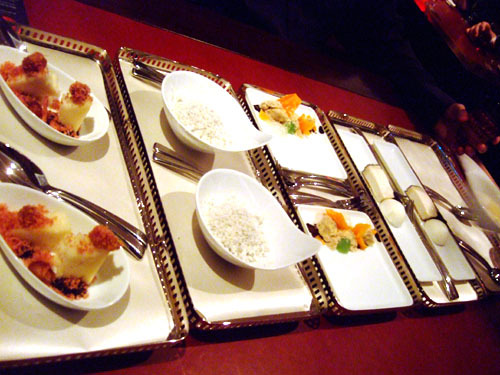 How interesting to eat an incredibly Asian inspired menu in a French setting. 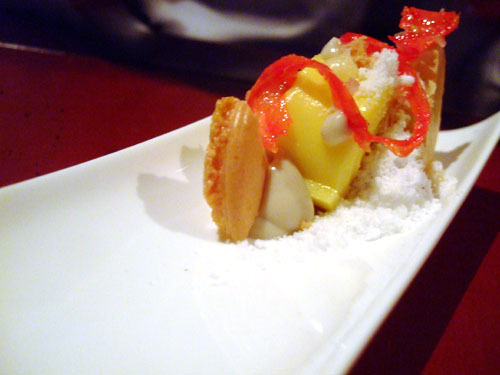 I also must say that is one of the most complex looking cheese courses I've seen in your blog. Usually they consist of pieces of cheese on a plate, but these looked like complicated, detailed cheese courses which made me drool. Yeah, it was quite the experience! The cheese here was just about the most inventive I've seen anywhere, and the rest of the menu wasn't too shabby either. my goodness. that all "looks' extremely impressive. almost made it on opening nite but changed my mind at the last minute. You're my idol! What a cool experience. I can't wait to try this place. tonyc: In addition to looking, the taste was pretty impressive too! I think that they should be able to accommodate an all dessert meal. elissa: Thanks! It was a very cool experience; definitely try it out. you have outdone yourself again. great pics, great food. i think you are right though, people are used to that location as a club...and it might be attended by customers lacking the fine taste you have. i think i must try that place soon! Thanks Paul! 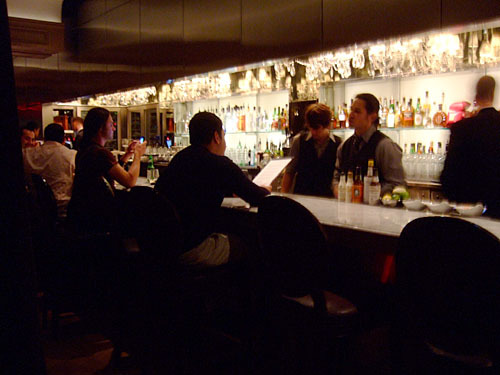 The location has been the site of a few clubs, so we'll see if it can survive as a restaurant. That did it ! It's that next time or Cut ! o.m.g. - YOU SERIOUSLY MADE ME DROOL HERE. If you ever want anyone to go restaurant hopping with you, please let me know ! Thanks Paul! This was easily one of the most "epic" meals to date, and certainly the longest in terms of course count. That being said, next time I'm at Urasawa, I want to break 40 courses! Thanks. I wish I could eat like this more often too! Quesiton, are you strobing to get that lighting? Nope. The ambient light at XIV was surprisingly good, though it did get dimmer through the course of our meal. I used a Fuji FinePix F30, a compact camera which is well-regarded for its low-light prowess. ah, I see. 3200 iso in 2006 was amazing actually. My dslr (also from 2006) doesn't even go that high. Nice. So after that japanese bbq place, what's next on your culinary quest? ISO 3200 is definitely only for emergency use. I believe I was using mostly ISO 400, then switched to ISO 800 when the light began to dim. What's interesting is that I bought the camera for $300 back on '06, and it's still selling for that price! That's unheard of in the digicam market and really shows how the demand for a P&S with decent high-ISO performance isn't really being satisfied with the current crop of cameras. 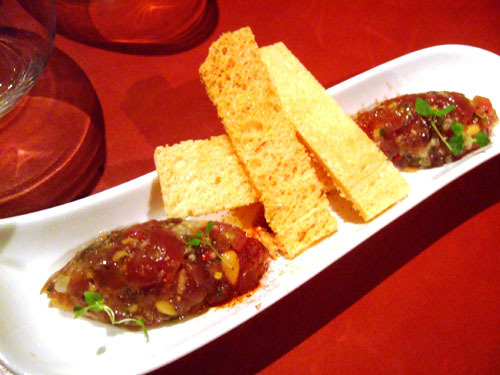 After Totoraku, I'm thinking I'm going to try Jose Andres' new place, Bazaar. Ah nice, I thought you'd pick Bazaar. Well, that camera shoots really well even at those ISOs. I need to get a mini tripod for clearer shots. Looking forward to your jose andres' review. I've read a lot about him. actually, looking at those reviews, that camera is pretty unique for a P&S. I don't think consumers are being led in the right direction when all these new cameras just have huge megapixels and large screens. Those features aren't as important as speed (fps) and iso sensitivity, as well as overall lens clarity. In fact, I think anything more than 6 megapixels is pretty useless unless you shoot landscapes. You made a great purchase with the F30. You're exactly right about the camera. These days it's all about hyping the megapixel count, and consumers don't know any better. As for Baazar, I have reservations for opening night, which has been pushed back repeatedly. It's currently the 17th. Hm, I wonder if they have any available openings that night. However, I don't think the damage to my wallet is warranted right now. I'm sure a full meal at Bazaar will run into the low hundreds, if you play it right. Low hundreds at least. 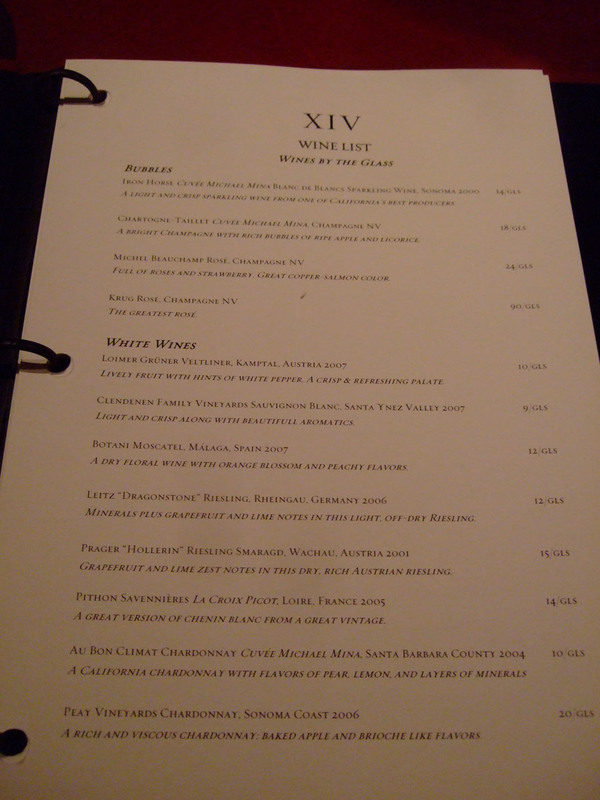 I want to do what I did at XIV and order everything on the menu if I can. everything on the menu..it might be a very large menu...at least you get 50% off since the opening date got moved. a good excuse to order everything. I just went there this weekend and really enjoyed the experience. A bit pricey but great food! Love your pictures and explanation of everything. Great blog! Thanks! I'm glad you enjoyed it. Did you notice that they added "the gamut" as a menu option as a result of this very dinner? Would you say it's the best restaurant in LA? 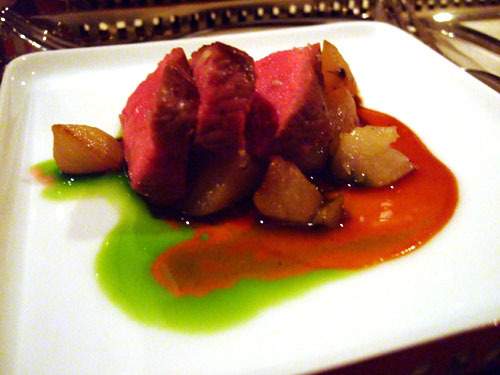 Your meal looks wonderful and I just read the review on Loving Annie's website as well. Added your site to my list of links. Thanks 5 Star. 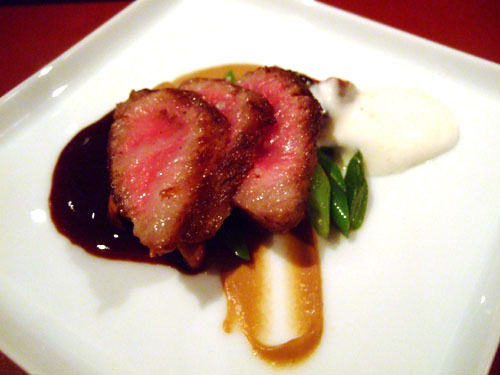 I enjoyed XIV, but there is no question in my mind that the best restaurant in LA is Urasawa. WOW... that beats our meal last nite!! damn.. i'm still full. Yup, the gamut--35 courses. I heard that they're no longer offering the option though, a shame.